Now don't fall over with my posting of this weeks Bloggers Challenge - No Layer Challenge. I'll be the first to admit I am the Queen when it comes to layers, I just *love* 'em! So, YES this surely was a challenge for me this week, and I'm the one issuing the challenge themes! I hope you'll consider joining me in this weeks challenge, just leave your link in the comments section, so I can stop by to see what you created. My card took a bit longer to create, as I hit some creative snags along the way. 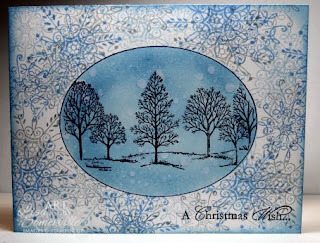 I had set out to use the Silver Luster card stock from Paper Temptress, only to be almost finished with my card to find I had Blue reinker on my fingers and touched my card - off to the trash that one went. Take two....Let's just do some simple embossing with the CuttleBug Flourished Frame that Gerrie and Linda both enabled me with. Gerrie posted a beautiful card using the frame here, then Linda had posted a sale enabler - so of course I had to check it out. How can you pass up FREE Shipping, No Tax and 20% off - well I couldn't! So where's my finished embossed card you ask? It joined my first one in the trash. On to take THREE! Still not willing to give up on this challenge, I opted for some creative masking. 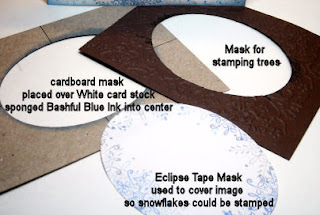 I created a Cardboard Mask, a Card Stock Mask, and a Mask from Eclipse Tape, using my Big Shot and Spellbinders Oval Die. I placed the Cardboard Mask over my white card stock, then sponged on Bashful Blue Ink. Removed the mask, placed my Card Stock Mask over sponged oval, then stamped my image from Stampin' Up! 's Lovely as a Tree in Black. Remove mask, replace it with the Eclipse Tape Mask. 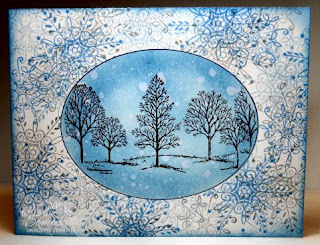 Stamp snowflakes from Serene Snowflakes using the Depth of Field Techinque (inks Going Grey, Bashful Blue, Ballet Blue). Remove mask. Wanting to add a touch of snow to the trees, I put the Cardboard Mask back in place and used the Spritz in Flick Technique. Let dry, then add your Faux Layer (trace oval) using a Navy Marker. Sponge edges with Bashful Blue ink. Here's the second photo of the card, I decided to add the sentiment from Stampin' Up! 's Home for Christmas as an after thought. Now for the NEWS part of my post. I'm excited to tell you that I've joined the Paper Temptress Design Team! Patricia at the Paper Temptress is celebrating her 1 year Anniversary with some great sales and giveaways! Be sure to check out the Paper Temptress Blog on Saturday, October 24th for all the details on the celebration and how you can enter to win FREE card stock! Looking to be inspired by No Layer cards? Click on the Bloggers Challenge Logo on my sidebar to see what the other players created this week. Thanks for stopping by, have a great weekend! Very pretty winter wonderland! Congrats on your DT news!! I remember when all my cards were one layer! Now it's a difficult thing to do, but you pulled it off great! (not w/out some trash tho, lol!) Congrats on your new position, have fun. Beautiful, Lisa! Love the blue tones you used and thanks for the directions too! This is very cool. I love the different feels and textures you got from one sheet of paper! Super cool! This is just beautiful Lisa! Beautiful card. Thank you for the way you listed all the instructions. Congrats on the DT news also. Love all those colors, this turned out beautiful! Wow, you would never guess it has no layers! Hah the "Challenger" challenges herself! Way to go and let me just say your did a fine job. Love this nice wintery scene (even though I don't want to experience it for real yet)- As for cards 1 & 2 let me just say it took me five tries before I got mine right so I feel your pain. Thanks for the challenge. This is one of the best I've seen today. Love the colors, the way the focal image is outlined and highlighted and I love those serene snowflakes in the back ground. Great card! What a great card--it "looks" like it has layers! Congrats on the design team honors. PS I made the candy corn/oreo/pretzel combo today using your suggestion to stir it all up and it worked great! Beautiful card and you've done well for a one layer card. Beautiful single layer card, Lisa! The masking and outlining really give your card the appearance of layers. Look at all of those masks and it's not even Halloween! HEE HEE HEE! That is a beautiful card, Lisa! It was worth all of the extra work to make those masks, for sure! Congrats on the new design team...another door has opened!!!! Congratulations on your new DT news!!! Your card is GORGEOUS!! thanks Lisa, it was a challenge. THUD! So GORGEOUS! Congrats on your new DT spot!